The traditional Swiss villages of Adelboden and Lenk both make good bases for the excellent slopes of an area often overlooked by overseas visitors. The area lying between the two villages has around 60 pistes catering for all abilities and has an excellent snowpark, but there are a number of other mountains nearby providing a wide range of varied on and off-piste runs. The pretty Alpine villages of Adelboden and Lenk lie in the heart of the Bernese Oberland, something like halfway between the the ski areas of Gstaad Mountain Rides and the Jungfrau. Despite inhabiting two separate valleys, possessing very different characters, and lying six miles apart, they are linked by the huge ski and snowboard playground that rises above and between them. Altogether the patchwork of pistes covered by a single pass amounts to 210km, but Adelboden and Link are little known by overseas skiers and snowboarders. It’s not a secret lost on the Swiss and expatriates, who can make this a busy resort at half-term – although off-peak the slopes are eerily empty and the lifts working at a fraction of their capacity. With over 80% of visitors to the resort Swiss or German, you won’t hear many English accents (although English is widely understood). There is much to like about Adelboden. The well-groomed runs and modern lift system are excellent for intermediates, but there are some pleasant off-piste and ski touring opportunities in the area. Even the experts come here – in January the World Cup circus comes to town for Slalom and Giant Slalom on the Chuenisbärgl. The resort was so attractive to Sir Henry Lunn (of Lunn-Poly fame, now part of Thomsons) that he organized the first winter package holiday in the Alps here in 1903, also the year in which the very first organized competitive Alpine ski race took place here. 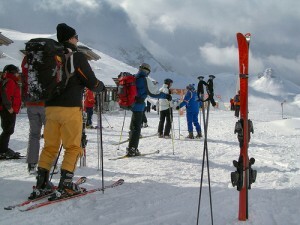 There is a good range of hotels in both Adelboden and Lenk, although no low-end hostels. Both resorts cater well for families and parties which include people who don’t want to ski or snowboard. As well as a range of other winter sports activities, both Adelboden and Lenk have spas and provide reasonable bases for exploring the Bernese Oberland. There are some good bars and restaurants available, particularly in Adelboden, but après-ski is a relatively muted affair and neither resort is recommended for hard-core party animals. Overall both Adelboden and Lenk come best recommended for mixed-ability parties, intermediates and families. It caters as well for snowboarders and skiers, with few long schleps or unavoidable T-bars as well as an impressive park. 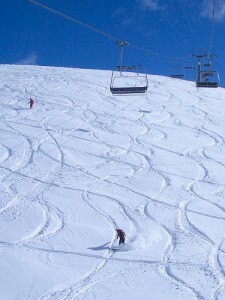 The season is reasonably long, and the variety of slopes and increased number of snow cannons generally ensures that there is good snow cover throughout the area from mid-December through April, although the best of the on-piste skiing is from mid-January to March, with good ski touring opportunities through April. Despite lacking a lot of steep runs, Adelboden has a long tradition of ski racing, with the first ski race in Switzerland taking place here in 1903. The tradition of racing is strong in the area, with the FIS World Cup slalom and giant slalom races held here every January. These are reputedly the toughest races on the World Cup circuit and attract tens of thousands of spectators. In total the ski region has 72 cableways & lifts, 210 km prepared pistes which are amongst the best prepared in Switzerland . 60% of main pistes have artificial snow, and the season runs from November to May. Despite being lower than many other Swiss resorts, the area has a good snow record and a number of snow-sure North-facing slopes. There are 36 mountain restaurants and bars, the highest density in Switzerland. Although there are eight ski areas covered by the “Adelboden-Lenk…dank” ski pass, in effect two comprise a linked network between Adelboden and Lenk, two are adjacent and the other 4 require a bus or a car to get to. Chidren under 6 are free; Families comprise 2 or more people aged 6 or over; KeyCard deposit is 5CHF; Photo at point of sale for purchases of 9 or more days; Other passes available, including limited area, season and partial-day passes. Ski passes for Adelboden-Lenk entitle holders to reduced rates on Gstaad Mountain Rides and Glacier 3000 at Les Diablerets, and unlimited free use of the Fribourg ski areas. The 2010-2011 season starts with very limited lift runs on 20th November , most lifts running from 11th December and, subject to weather, all lifts working from 18th December. 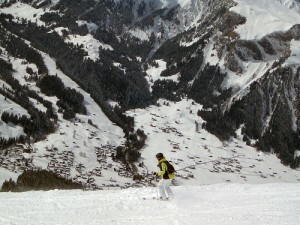 For most of the area, the season finishes 25th April with some limited skiing until May. Accessible from the centre of both Adelboden and Lenk, this impressive area has been substantially improved and extended over the years to provide one of the very best ski and snowboard resorts in Switzerland. At peak periods and weekends it can get busy at the bottom station, particularly in Adelboden, but for most of the time this huge area provides queue-free lifts and uncrowded slopes. For intermediates there is enough to entertain, but advanced skiers may want to explore some of the many off-piste opportunities around Geils once they have mastered the black runs from Luegli and Lavey, but caution is required not to stray into the many designated wildlife reserves. 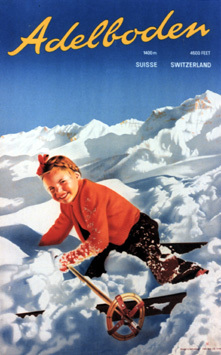 The run from the Lavey down to Adelboden is quaintly referred to as “a grand tour for skiing ladies” in Walter Pauses’s famous 1961 guide to the best hundred ski runs in the Alps. For boarders there is the outstanding GMP snowpark (Gran Masta Park). The 600m long SW-facing slope at 1850m has it’s own lift and beginners area, and a range of kickers and rails… and a bar. Note, however, there are some flatish areas around, so always keep your speed up if the terrain looks flat up ahead – it probably will be! 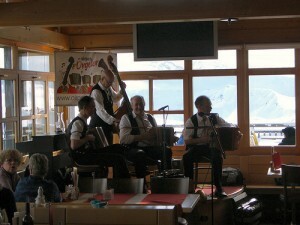 Recommended for mountain eating is Restaurant Aebi on the Aebi-Oey piste. A good place to rendez-vous is the Wunderbar on the Hahnenmoos-Geils piste. Elsigen-Metsch are particularly convenient for Frutigen and provide the closest slopes for people driving into the area. 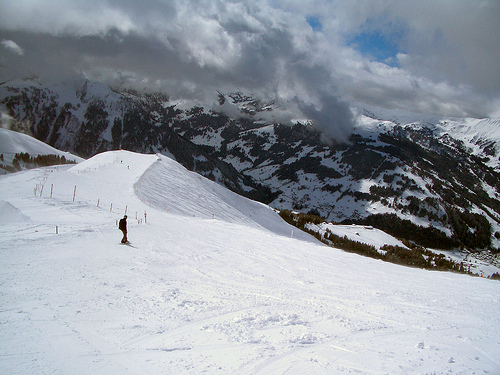 The area has roughly 30km of pistes and a larger drop than that at Adelboden itself. The runs at Elsigenalp (2344m) and Metschalp (2142m) are accessible from the lift at Elsigbach which also has ample free parking. The bus runs from Frutigen to Elsigbach during the winter every hour, arriving and leaving the lifts on the hour and taking around 25 minutes to complete the trip. 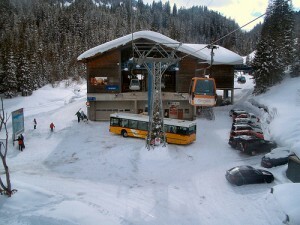 Sometimes the buses also drop and pick up at the lift at the bottom of the Metschalp, but the trip is longer and the mountains are connected. Recommended run is the 950m drop from Elsighorn down to Elsigbach. A bus runs regularly on the half hour from Adelboden bus station to Unter dem Birg in about 20 minutes and there is ample free parking at the bottom station. With a designated free-ride area (which has it’s own facebook group!) and the longest season in the area, the Engstligenalp plateau is well worth visiting. It is also a fabulous area for ski touring, off the Wildstrubel for example, or off-piste, with a run down to Kandersteg possible – there is a bus back to Adelboden. The area is never crowded, the only real drawback being you need to take the cable car back down at the end of the day. Particularly recommended for snowboarders of all abilities. Incentive Adelboden (http://www.incentive-adelboden.ch) offer the opportunity to have a fondue in an igloo on Engstligenalp or to stay overnight in an igloo (but bring your own sleeping bag). When the main sloped get busy, Tschentenalp makes for a pleasant diversion, with lifts from Adelboden, a few easy off-piste runs and a marked trail back down to the village. The restaurant on the Tschenten is open in the evenings, and there is a floodlit toboggan run down to the village. The other side of the valley in Lenk from the main Adelboden-Lenk area, Betelberg is an excellent area for intermediates, beginners and children. The impressive 7km red Tschuggen run is recommended. This small area lies between the Simmertal valley and the Gruyere region. It is about half an hour by bus from Boltigen station, or an hour from Lenk by train (changing at Zweisimmen) and bus. It is covered further in the Fribourg section. This small but charming family-oriented area with 18km of pistes is covered in a separate Kandersteg section. It is not connected to the other ski areas, although it can be reached off-piste using the lifts covered by the area pass to get sufficient elevation for the descent. The delightful return journey to Adelboden by bus takes about an hour. The Swiss Snow Sports School has English, French, Italian, German, Spanish, Dutch and Japanese speakers at the last count and takes children from 3 (http://www.skischule-adelboden.ch). There are a number of other schools including Alpineschule Adelboden (www.alpinschule-adelboden.ch), the Official Snowboard School, Crazy Sports and Timeless Snowboard School (http://www.get-timeless.ch). Schneesportschule Adrenalin is in Lenk. All schools will provide private tuition and off-piste and tour guiding. There are numerous ski hire shops, including the ubiquitous Intersport on Dorfstrasse in Adelboden at Talstation Silleren, Oey and in Oberriedstrasse, Lenk. In addition to guided ski and snowboard tours Alpineschule Adelboden (www.alpinschule-adelboden.ch) provide snow-shoe hikes, overnight stays in igloos, ice-climbing, avalanche and deep-snow courses. Hang gliding courses are also run in the area (www.cloud-7.ch). For group activities Incentive Adelboden develops suitable programmes (www.incentive-adelboden.ch). Adelboden, meaning roughly “The Noble Floor” lies on a terrace overlooking the 600m drop of the Engstligen waterfalls, at the top of the valley of the Engstlige river and beneath the Engstligenalp plateau. A number of other valleys fan out from Adelboden, but the only practical route to the town is along the route of the Engstlige by road from Frutigen. Adelboden was the first “Alpine Wellness” resort, reputedly located at a medically optimal altitude and blessed with pure spring water, a mild, invigorating climate, fresh air and an attractive setting. A number of hotels provide spa facilities, including the Parkhotel Bellevue and the stylish Cambrian. The village church, consecrated in 1433, is worth a visit with its excellent frescoes by the entrance and stained glass windows by Augusto Giacometti. The village has quite a lot to offer if you’re not skiing or snowboarding – a skating rink, horse-drawn sleigh rides, a swimming pool and a cinema (which shows many movies in English). Adelboden is also home to the Adelbodner Skibock, a simple ski and seat arrangement for getting down the slopes, tuition in which is provided at ski school if you so wish! Contact the Tourist Centre for a range of children’s activities including a nursery for 3-6 year olds (+41 33 673 80 80). Nova (+41 33 673 8383), the Cambrian Hotel’s stylish Italian restaurant. Sporthotel Adler (+41 33 673 4141) is recommended for Fondue. Hotel Bären (+41 33 673 2151) is recommended for Raclette. Thai Mandarin (+41 33 673 8888), attached to the Viktoria Eden Hotel. Café Haueter (+41 33 673 12 34) for pastries and home-made chocoloate. Amongst the various bars Scott’s Bar at the Cambrian, the Arte Bar & Kunst, the Berna Bar and the Time Out pub are recommended. Other well-regarded hotels include Hotel Steinmattli , Hotel Baren, Sporthotel Adler, Hotel Bristol and Hotel Waldhaus Huldi. Many hotels feature spas. You can stay on the slopes at Berghotel Hahnenmoospass (www.hahnenmoos.ch). Lenk lies in on the Simme river at the foot of the Wildstrubel massi, and is the highest municipality in the Simmental valley. It is linked by rail and road with Zweisimmen, 20 minutes away, where you have easy access to the largest area of the Gstaad Mountain Rides – 105 km of pistes spread over two mountain chains between the Simmental and the Saanenland. Some ski passes provide for access to this area, and it is strongly recommended that, if you choose to stay in Lenk for a week or or more, you visit this ski area. You can also change at Zweisimmen to visit Gstaad itself, a further 30 minutes away. Lenk is one of only a couple of dozen resorts with the Swiss Tourist Federations “Children Welcome” designations. Antica Posta, attached to the Parkhotel Bellevue, on Rawilstrasse makes great pizzas from a wood stove +41 33 733 11 10). The Anker on Rawilstrasse is well regarded (+41 033 733 04 40). Recommended bars include the Tipi-Bar on Flöschtrasse and Andy’s pub on Oberriedstrasse. Budget hotels include the 3 star Hotel Sunnestubli , and the child-friendly Parkhotel Bellevue (www.bellevue-lenk.ch)‎ and Hotel Krone, which offers childcare for all ages (www.krone-lenk.ch). Frutigen, at 800m, lies on the banks of the Kander river, which runs into Lake Thun. It lies at a railway junction where the longest land tunnel in the world, the Lötschberg Base Tunnel, separates from the railway line that leads to the older Lötschberg Tunnel, with both lines re-uniting in Brig, in the Rhône valley. Frutigen is a small town, with some hotel accommodation. It has bus links to skiing on the Elsigen and main Oey lift in Adelboden, and the rail line runs to Kandersteg, from where there is access to the attractive pistes at Kandersteg and Wiler/Lauchernalp. The church dates from 1421 but was reconstructed in the Eighteenth century from the old parts following a fire, with some baroque flourishes added for good measure. The tropical hothouse in Frutigen is worth a detour, utilizing as it does the warm spring water that flows from the Lötschberg base tunnel. It’s unlikely you would choose to stay in Frutigen as opposed to one of the nearby resorts, but the Hotel National is conveniently located and well regarded. If you fancy staying in the mountains, try the Snow Beach Lodge at the nearest ski area, the Metsch (www.huettenzauber.ch). All bottom stations have car parks and ticket offices. For day-trippers, note that on the Post bus to Adelboden the nearest bus stop to the main ski area is just before the village, Adelboden, Mineralquelle (Not Oey), from where you cross the road for a three minute walk to the Oey gondola station. At Lenk the main ski area is accessible using the cable car at Metsch-Rothenbach (Metschbahnen) This is just under a kilometre from the train station to walk, along Oberriedstrasse, or four minutes by bus. 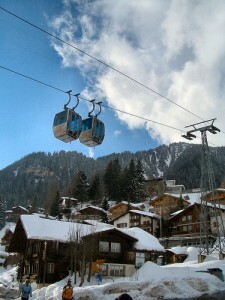 Similarly the gondolas at Talstation Betelberg are a walk or short bus journey away from Lenk station. Geneva and Zurich airports have direct trains to most regional rail hubs. Basel has a very good bus connection to the main rail station. Other airports provide infrequent bus services, but Bern is the closest airport and has a bus connection to Bern SBB railway station. Flybe operate weekly flight from Southampton ot Bern. Car hire is available at airports – book in advance and ask for ski racks, snow chains, and winter snow tyres as necessary. 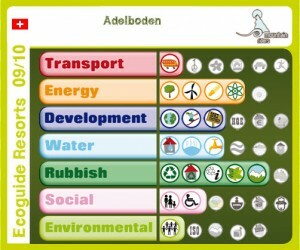 Information on Adelboden in Dutch is located at the Swiss Winter Sports web site. If you are visiting this site and have any information on resorts not covered here, or other information that doesn’t fit under any other topic but which is relevant, here’s the place to put it!